MARGARET GRAHAM was a convict woman who was tried and convicted at the Old Bailey on 16 September 1812 and sentenced to seven years transportation per Wanstead (1814). On arrival in the colony, she was sent to the first Parramatta Female Factory, i.e. the Factory Above the Gaol, which was located at present-day Prince Alfred Square, Parramatta, including land now occupied by the Riverside Theatres. Forwarded to the first Parramatta Female Factory, the Factory Above the Gaol: 13 January 1814, Factory Above the Gaol, (present-day Prince Alfred Square, Parramatta). Old Bailey Proceedings Online (www.oldbaileyonline.org, version 8.0), 28 October 1812, trial of MARGARET GRAHAM (t18120916-127). CLICK IMAGE TO ENLARGE. The Factory Above the Gaol, Parramatta’s first Female Factory, is on the far right of this image near the old gaol bridge, on the present-day site of Lennox Bridge, Riverside Theatres and Prince Alfred Square. 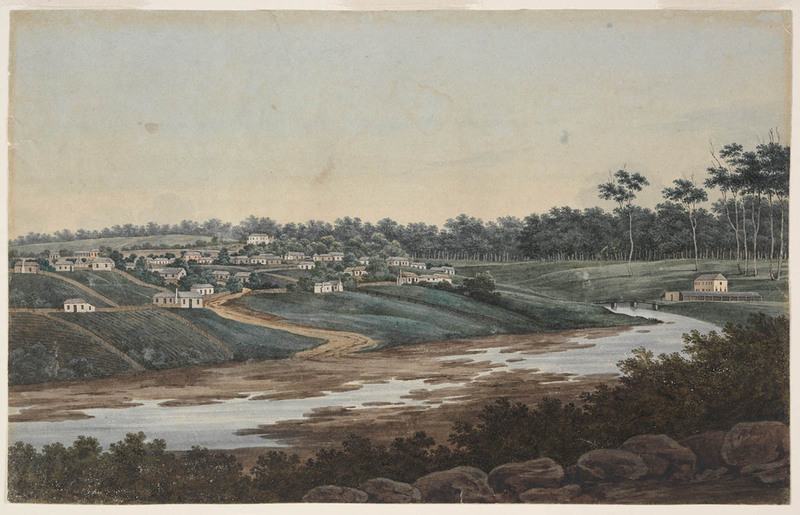 “A view of part of Parramatta Port Jackson, [1809? ],” in Series 01: Australian paintings by J.W. Lewin, G.P. Harris, G.W. Evans and others, 1796-1809 [32 watercolours], Vol. 3. Courtesy of Mitchell Library, State Library of New South Wales. PXD 388 / FL1152086. New South Wales Government, Copies of letters sent within the Colony, Series 937, Reels 6004-6016, (State Records Authority of New South Wales, Kingswood, New South Wales, Australia). Old Bailey Proceedings Online (www.oldbaileyonline.org, version 8.0), 28 October 1812, trial of MARGARET GRAHAM (t18120916-127), accessed 4 December 2018. The Digital Panopticon (https://www.digitalpanopticon.org/, Version 1.1), Margaret Graham Life Archive (ID: obpt18120916-127-defend1067), accessed 4 December 2018.